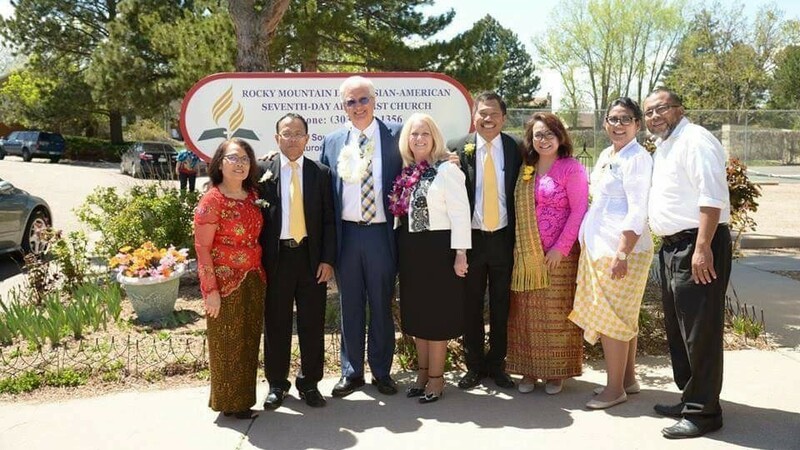 Rocky Mountain Indonesian-American Group Becomes Church » With 150 members and guests in attendance for the May 5 celebration, their pastor Dr. Purasa Marpaung, along with RMC president Ed Barnett, was on hand to welcome them to their beautiful sanctuary. 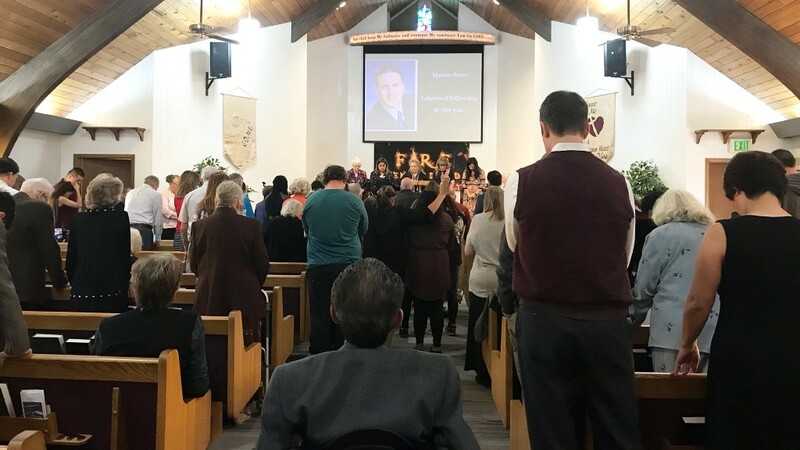 Begun nearly 20 years ago under the pastorship of Pastor Yorum Tumburante, who was on hand for the celebration, the group spent several years in a rental facility near downtown Denver before finding and purchasing their current venue. Remodeled by volunteer labor from the community, they were able to save as much as $200,000, and the renovation accorded them, among other upgrades, a sanctuary and fellowship hall. Purchased for around $500,000, the former owners, after the renovation, offered them $1,000,000 to buy it back. "They are enhancing the global expression of Adventism," said Barnett, adding that "they are among the most kind and gracious people I've met." 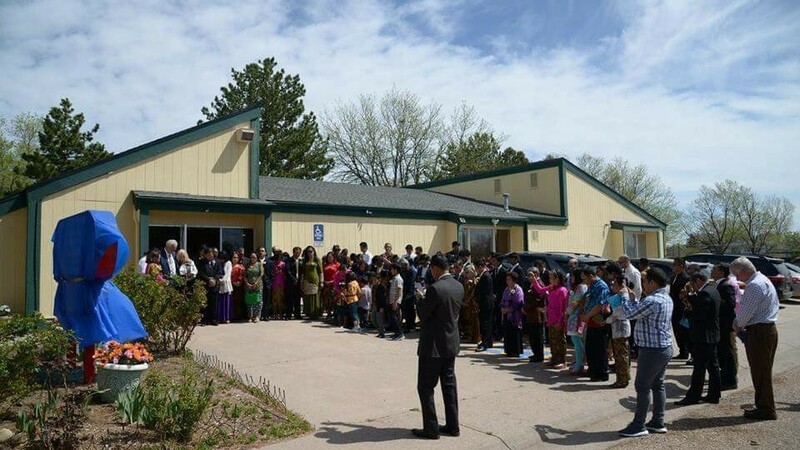 Located in the heart of Aurora within a 2,000 to 3,000-strong Indonesian community, the church members, skilled in working with handicapped people, are considering opening a daycare for young people (ages 7 to youth) in their fellowship hall. "We see this work as one of our missions," commented Marpaung. The permit previously held was for a school, so the new church needed new permitting which came through just two weeks before the celebration, according to Marpaung. Mile High Academy Hosts Real World Learning Exhibition » For the second year running, Mile High Academy hosted Real World Learning (RWL) All School Exhibition. 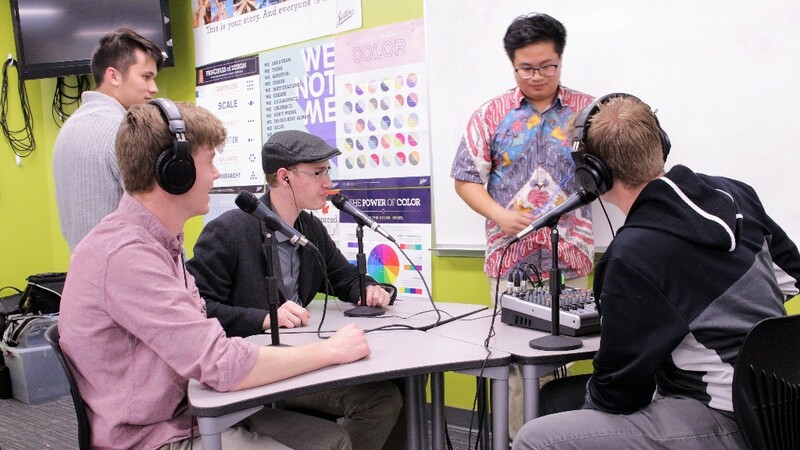 Family, friends, and community members were invited to participate in year-long student projects. Visitors walked through the hanging art exhibit in the Upper School and learned from students about the “Linus Project," asking questions along the way. First graders roamed the halls handing out colorful flyers they created to inform the community about their garden. Fourth grade gave a slide and video presentation on their ecosystems, answering visitor’s questions. Every grade engaged their audience and begged participation. 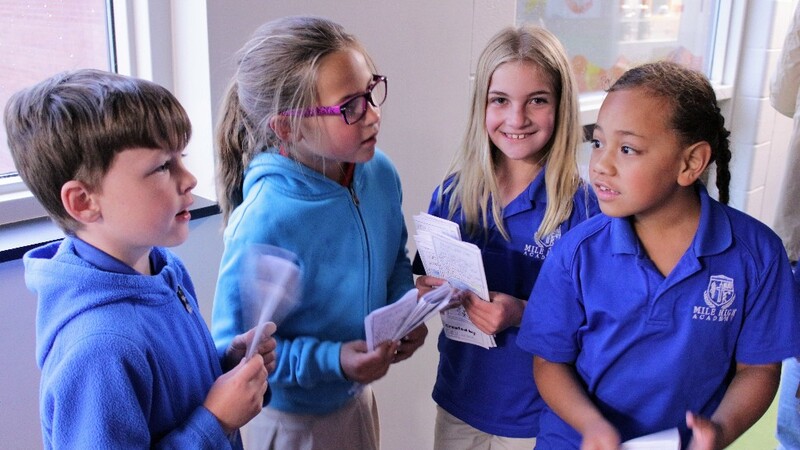 That's is what RWL is -- learning that encourages students to ask questions, think creatively, find solutions, and take those solutions out into the world. The passion with which each student shared their learning, the amount of information they conveyed, all went far to demonstrate that RWL really is the best way for retention to happen. From Preschool to Upper School, each student was able to answer questions, present confidently, and shine with the pride of a job well done. Ultimately, that is what RWL is about, instilling ownership of learning into the student. That's what our educators want for their students -- knowledge they will take with them beyond the classroom. 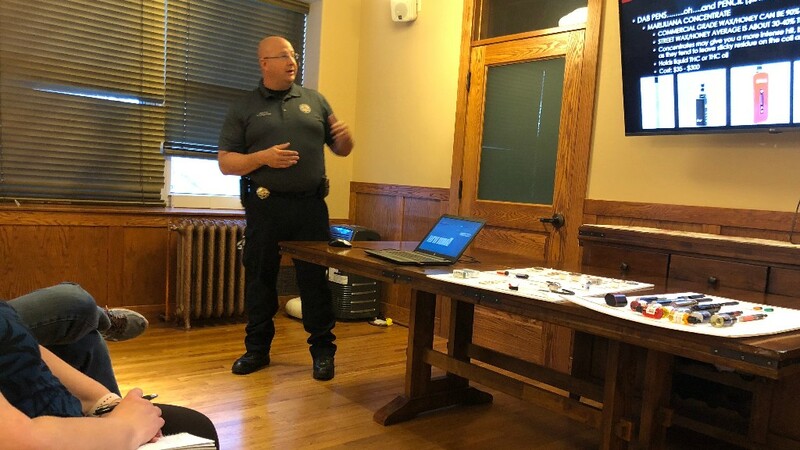 Campion Academy Staff Receive Substance Abuse Training » Deputy Kevin Kingston from the Larimer County Sheriff's Department provided training to Campion staff on the world of substance abuse Wednesday evening, May 2. The landscape of substance abuse, Kingston explained, is rapidly changing and it is our duty to stay current and knowledgable. "This information is important for the staff to learn as we need to be aware of what is out there threatening our students so we can be better prepared to help those who find themselves caught up in this whirlwind of temptation," says Don Reeder, Campion Academy principal. Deputy Kingston instructed the staff on what to watch for in behaviors and in paraphernalia and recommended resources available for Campion's use through Larimer County. Campion Evangelistic Series Changes 13 Lives » For 13 nights, Evangelist Taj Pacleb and Pastor Nestor Soriano shared messages from the book of Revelation at Campion Seventh-day Adventist Church. 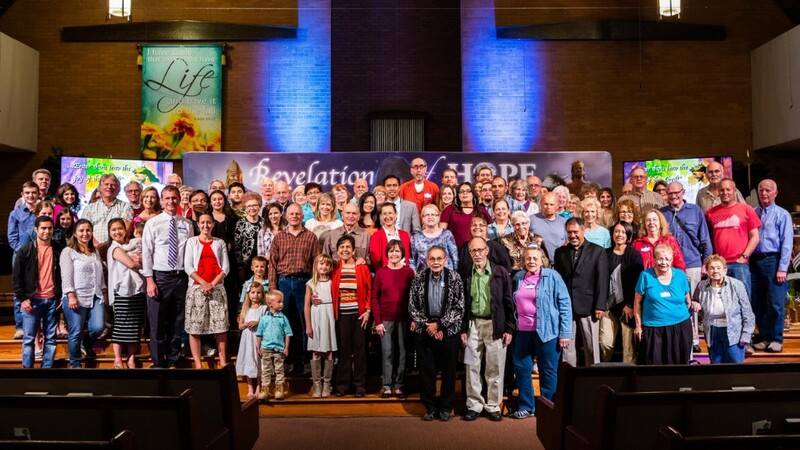 Beginning April 13, between 4 and-100 attendees gathered to hear the Bible expounded, analyzed, and practically applied in the Revelation of Hope series. True to its promise, the preaching of the Word changed lives. For 13 people, this change was evidenced by their decision to be baptized and commit their lives to Jesus Christ. Josh first sought to learn about prophecy when the Fort Collins church held its evangelistic series. His interest grew, and night after night, he came faithfully to every session of the Revelation of Hope series at Campion. When it ended, he was more than eager to be baptized. “I started keeping the Sabbath before all of this,” he said, but he didn’t know it was supposed to be on the seventh day. With Revelation of Hope, “it seems like God is just taking me to another level.” Josh was baptized on Sabbath, May 5. Revelation of Hope was not just for people who have never heard about Bible prophecy before. It was also for church members who might have forgotten the first time they were in awe of the Bible and the Adventist message. "Rubbing shoulders with those learning new truths, we get to experience that wonder once again," commented one attendee. Fire Rekindled '18 Series Concludes its Fifth Season » Attendance in Fire Rekindled ’18 series “broke records” in its fifth year of evangelistic presentations, according to Ruddy Vivanco, pastor of Denver West, Golden and Lakewood Fellowship churches. The series ended the last weekend in April with presentations by Pastor Randy Skeets, one of seven preachers. “Our churches have never had that many people in their history. We had to open other rooms in the churches and project the service for the overflow,” Vivanco said. “What a powerful six weeks it has been,” said Denver West church member Mona Fellers on the eve of the seventh and final weekend at her church. Visitors from the Front Range area, as well as from other states came to have their "fire rekindled" and the Lord has not let them go away disappointed. “God has poured out His Spirit at each and every meeting to packed churches,” she added. The program, designed by Pastor Ruddy Vivanco, began in 2011. “He [Vivanco] spends much time and prayer every year with great persistence, as several of the speakers remarked,” Mona Fellers commented. “The Lord always blesses, but this year the fire burned brighter and hotter,” Fellers said of the seven “power packed” weekends with seven speakers. Pastor Vivanco explained that the purpose of the series is “the same one every year. We desire to bring people to Jesus.” The series also has special programs for children. “Kids will come to me asking what time that program will start and they will bring their parents with them,” Vivanco commented. Vivanco shared that the outcome of the meetings is seen in baptisms, increased tithes and offerings, and “members recommitted to the Great Commission of Jesus Christ." This is what “we all expect after evangelism has taken place,” he added. --RMCNews with Mona Fellers and Ruddy Vivanco. Brighton Church Joins Community to Work With Help for Homes » Brighton Adventist Church joined forces on May 5 with city officials, faith-based and civic groups, neighborhood associations and local firefighters to volunteer with Help for Homes. An annual event sponsored by Brothers Redevelopment Inc and the city of Brighton, the event assists low-income, disabled or elderly homeowners by painting structures and fixing up homes in need of minor exterior repairs, as well as doing yard work. The Help for Homes program began in 2006 and has repaired and provided maintenance to more than 200 homes. In addition to exterior work, homeowners also receive a basket filled with baked goods, an aspect of the program the Brighton Church has worked on for several years. "It was a pleasure, this year, to come full circle and meet the recipients of these gifts," remarked Pam Taylor, Brighton Church member. Jayme Blaire, Community Services Volunteer Coordinator, is well acquainted with community involvement. As a student at Union College, she was actively involved with coordinating Project Impact and many other outreach activities. She is excited to partner with local project managers as she involves Brighton members in ministry to their community. Her philosophy on volunteerism is, "Why reinvent the wheel when there are already so many efforts happening locally that we can join and assist with?" She believes we can walk beside our fellow Brighton residents, extending a helping hand and building relationships. The Brighton Church believes that becoming involved in their community is one way they can fulfill their mission and motto -- Do Love. 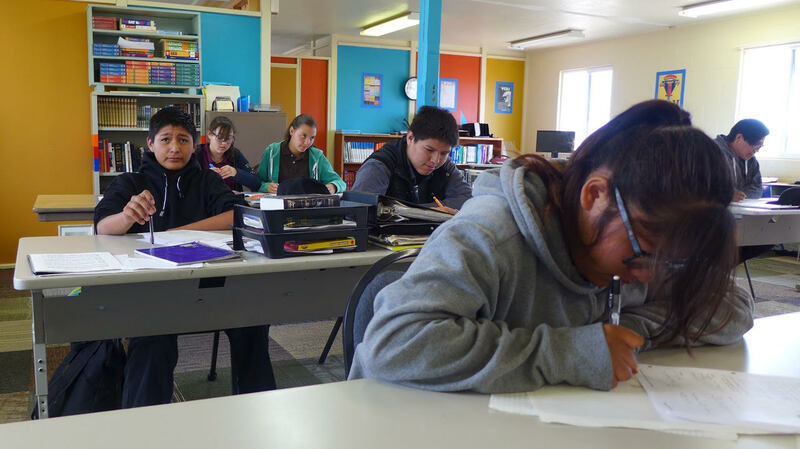 Navajo Students Being Trained for Medical Missionary Work » Looking toward the Health Fair held during camp meeting in May, La Vida Mission's health educator and medical missionary, VJ Panganiban is training high school students in healthy lifestyle and medical missionary work, a part of their regular school curriculum. He is teaching them to not only adopt a healthy lifestyle themselves, but also to be health missionaries to their families and their people. In March, La Vida Mission students attended the Whiterock Chapter House Health Fair where they assisted with La Vida's booth, welcoming people and helping them fill out the Community Health Survey Others mingled with attendees, talking to them about La Vida Mission and their health program. Still others introduced visitors to nutritious food samples, offering green veggie smoothies and vegan cheese made from carrots and potatoes. At first, visitors refused to try the nacho samples offered until they discovered it contained vegan cheese and then they asked for it, according to Dorie Panganiban, La Vida Community Outreach Coordinator. Following this experience, the same students went with Pathfinder Director Steve Gillham and other Pathfinder staff to the local Chapter House where they served a meal to military veterans passing through on a one-week Honor Walk from Thoreau, New Mexico to Shiprock, New Mexico. "We enjoyed serving our community and witnessing for Jesus," was the sentiment expressed by students as they returned to La Vida Mission. DeeAnn Bragaw to Coordinate Women's Ministries » New Women's Ministries Coordinator DeeAnn Bragaw accepts the torch passed from Ginger Bell following her retirement. Having already served as part of the women's ministries leadership team made up of several women from around RMC, DeeAnn does not hide her excitement to continue to "carry the torch Ginger has carried so beautifully for the last 10 1/2 years." "During Ginger's time as coordinator ," DeeAnn continues, "she encouraged each church to have a women's ministry leader and spoke with those leaders to offer support and encouragement, which included attending as many women's events in the local churches as her schedule allowed. Ginger's gifts of graciousness and tact, coupled with her strong leadership skills made working with her a joy! She has a deep love for every woman in our conference. In addition to supporting local church events, Ginger planned and orchestrated leadership events, retreats, and service activities on a conference-wide level. She is greatly appreciated and loved and is known around the North American Division as the best of the best!" 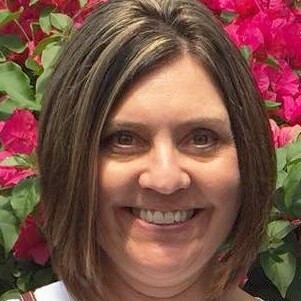 Having officially taken the women's ministry lead in early May, DeeAnn shares her hopes for the ministry. "By God's grace, and partnering together with our leadership team, I look forward to providing continued support and resources to women’s ministries in our local churches along with providing training and tools to help encourage every women in RMC to deepen her walk with Jesus and form meaningful relationships with those both inside and outside the church to build God’s kingdom. Please be on the lookout for future leadership training opportunities, and please reach out to me with your thoughts and ideas! It's my pleasure and honor to serve both the men and the women of RMC in prayer ministries, and now to lead our women's ministries team as well." RMC's conference-wide retreat is already in place, September 28-30 at Glacier View Ranch, featuring our General Conference Women's Ministries Director, Heather-Dawn Small. Ginger and her ministry will be honored at a special celebration on Saturday night, September 28. EVERYONE is invited, whether or not you are able to attend the entire retreat! 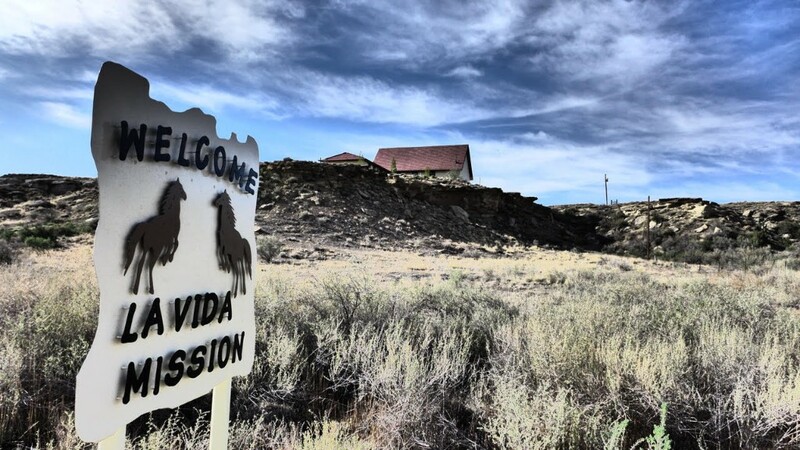 Prison Ministries Convention Comes to Colorado Springs in July » The 26th International Prison Ministry Convention will take place July 25-28 at Hotel Elegante Convention and Event Center in Colorado Springs. Organized by The Alliance of Prison Ministry Organizations and Affiliates (APMOA), the convention offers experts with many backgrounds and abilities as seminar presenters, panel participants, and plenary session speakers, including Kevin Steenbergen, Chief Chaplain, Colorado Department of Corrections, Eduardo Monterio, Prison Ministries Director for the New Jersey Conference, and Gary Thurber, President Mid-America Union Conference. Planned for laypeople and pastors involved in prison ministry or those interested in learning best practices and Christ-centered methods for evangelism behind bars, and for family support and ministry to returning citizens. Opportunities for fellowship, music and testimonies are also included in the program. Sabbath features Sabbath School and Divine Worship Service in the morning, lunch in the afternoon, and a banquet in the evening. Registration is required to participate in most convention events. There is a reduced rate for early registration. See the seminar brochure for additional information. Mid-America Union Conference, Rocky Mountain Conference, and Central States Conference are hosts for this year’s convention. Rocky Mountain Pastors will be at Yellowstone National Park beginning every Sabbath from Memorial Day through Labor Day. Traveling through Yellowstone this summer? Join them for worship beginning at 10 a.m. each Sabbath in Old Faithful Lodge. Campion Academy » Sacred Spring Concert will be held at 7:30 on May 11 at Campion Academy. Campion's Student Association (SA) Picnic and Pops Concert will be held May 20 at North Lake Park at Lake Loveland. 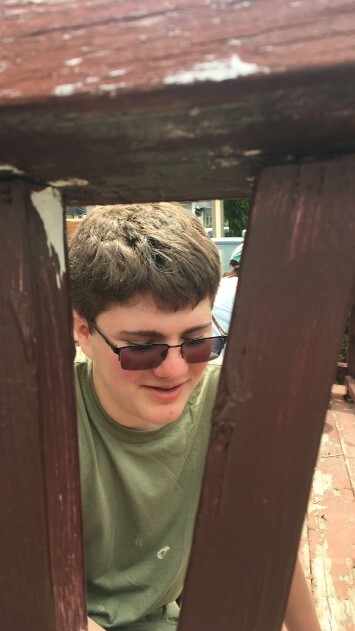 Edwin Gallagher Memorial Service » A memorial service for Edwin Gallagher will take place at 3 p.m., June 2 at Denver South Seventh-day Adventist Church. Ed Gallagher held many positions in the Colorado,Wyoming and Eastern Slope Seventh-day Adventist churches, schools, and hospitals. Mr. Gallagher passed away in New Zealand in December 2017. 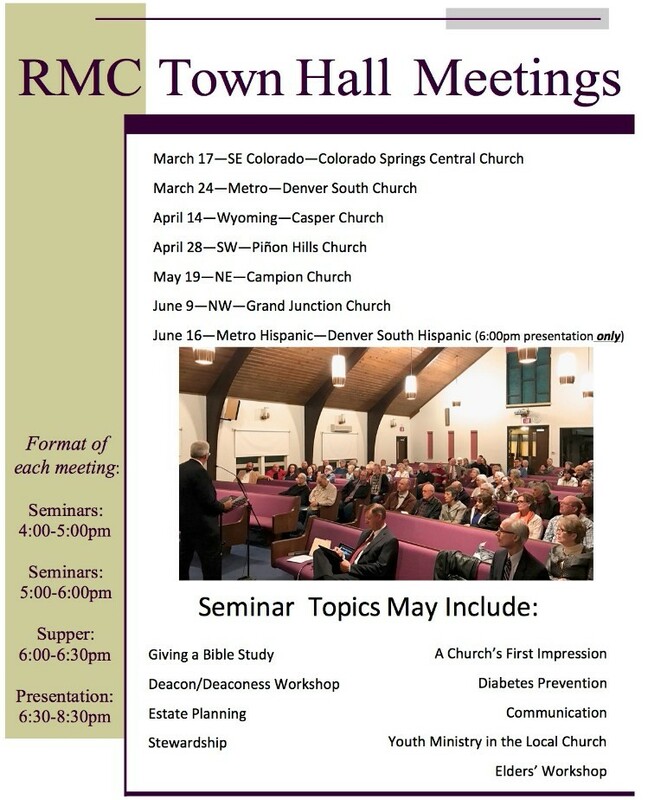 Denver South Church is located at 2675 South Downing Street, Denver CO 80210. H.O.P.E. Prayer Summit » Featuring James Black from NAD Prayer Ministries, this prayer summit will be held September 7-9 at Glacier View Ranch. Annual RMC Women's Retreat » Heather-Dawn Small, GC Women's Ministry Director will speak at the annual retreat September 28-30 at Glacier View Ranch. The Rocky Mountain Conference has an immediate opening for a Field Representative in its Planned Giving and Trust Services department. In this position, the employee will visit and fulfill requests for assistance in estate planning, including information gathering and execution of documents. For information about duties/responsibilities, qualifications and how to apply, please visit the job posting on our website at http://www.rmcsda.org/hr-field-representative-trust-services. HMS Richards Elementary » Located on the campus of Campion Academy, HMS Richards Elementary School is looking for a part-time preschool teacher for the upcoming school year, 2018-2019. To qualify, you must have teaching certification or a director's license. If you are interested, send your resume to [email protected] or call 970-667-2427.
http://adventisteducation.org/employment/opportunities?category=4 or contact the Rocky Mountain Conference education department. Vista Ridge Academy » Vista Ridge Academy is seeking a part-time aide for our Early Childhood Education program. Candidates must meet state requirements for an Early Childhood preschool teacher. For more information or to find qualifications, contact our Early Childhood Education Director, Sandy Hepp, at [email protected] (303.828.4944). July 11 - 15, 7 a.m.